A little slice of the world's best mobile phone. So much of the power from the HTC One in a shrunken design - a brilliant phone that gets a lot right. What are you supposed to do when you make the world's best phone? HTC thinks the answer is to make it smaller, shave off a few unnecessary bits and make it a whole lot cheaper. 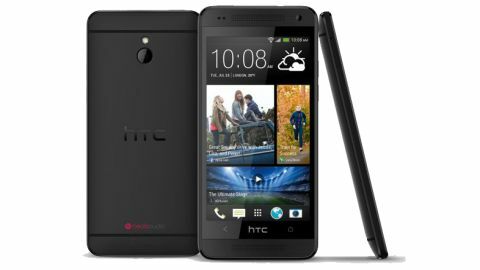 We're excited about the prospect of the HTC One Mini, as it's a handset with all the best bits of the HTC One without as much of the cost. That's got to be hitting a new segment of the market, right? A look at the spec list, which admittedly isn't the right way to weigh up a phone's prowess, tells a different story, as it's only coming with half the power of its bigger brother. The HTC One Mini has a dual core Snapdragon 400 processor, 1GB of RAM and 16GB of internal storage. The screen is a 4.3-inch option, running at 720p rather than the Full HD level of the original One. The reason we've got those elements out of the way early on is that they're rather irrelevant to the review - the internal storage issue aside - as the HTC One Mini does what you'd hope it would. Namely, it makes the One more pocket-friendly, both literally and from a financial perspective. When it comes to making phones look and feel nice, HTC has long had decent credentials. It created something unsurpassable with the One, but with the One Mini it's come up with a decent compromise that doesn't make it feel like you're getting a hand me down phone. The aluminium back is still present and correct, but is joined by a plastic rim, the same as sported by the HTC One X+. It diminishes the overall effect of the phone, but only slightly; we actually saw someone gasp when they picked up the One Mini, such was the effect of putting that aluminium chassis in the hand. And that's where HTC has nailed the design - the smoothness of the back is excellent, and makes you feel like you're holding a really premium piece of kit. The plastic is almost invisible when you're holding the phone normally, and the decreased weight (down to 122g from 149g) feels like the correct amount for the smaller screen. The front facing speakers are smaller than the larger model, which makes sense of course, but they're made of a more coarse metal, making it feel a little less finished and a little more industrial. It's not a bad thing, but does make the One Mini look a little cheaper. The camera module is exactly the same as the main One, according to HTC, although it's shorn of the optical image stabilisation that we're seeing on top end handsets. In this case, it results in a smaller overall lens, which helps keep the One Mini so compact. The flash has been moved too, but this doesn't seem to change the quality of the photos. One element we do like over the larger model are the volume keys, as they're now distinct options that make it easier to find and hit them when not looking directly at the phone (perhaps when on a call, or listening to music in the pocket). While on the HTC One Mini they feel a little wobbly and not as premium, we still prefer the layout to the single block on the One. Other than that, we're massive fans of the design on the HTC One Mini. It's a phone that just wants to be touched, with all the buttons in the right place. The screen, being 4.3-inch rather than the 4.8-inch option on the One, is a real boon to some people (namely, those that want to leave the iPhone 5 but don't want a massive screen) and serves its purpose well. With a 342ppi pixel density, that Super LCD2 screen (close to that seen in One in terms of technology, although that's the slightly superior Super LCD3) is a great option that works very well in direct sunlight. It's covered by Gorilla Glass 3, which saw nary a scratch during testing, and is the most crisp in its segment. It certainly makes the Samsung Galaxy S4 mini look underpowered and underspecified by comparison, and does well to come in at the same price point - in short, the screen on the HTC One Mini is a real stunner and should be a consideration point for anyone thinking about buying this phone. The price of the HTC One Mini is also pretty palatable: while the £330-£380 off contract price is a little steep, it still seems wholly fair for what you're getting. Of course, we'd like to see all this packed into a £100 device, but it's not going to happen. The contract price is around £25-£28, which is also pretty decent, and you're getting far more than 75% of the One for the equivalent cost.